Travel through time to ensure Jill's wedding goes off without a hitch. "Cake Mania 3 has Jill going back in time through five different time eras, and when you have played all five, you unlock a sixth level. Lots of new characters. 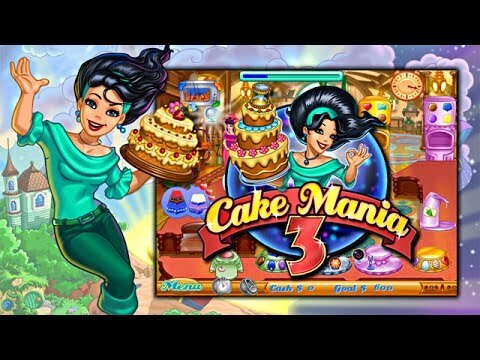 If you enjoyed the other Cake Mania games, you'll enjoy this one too." As Jill nervously prepares for her long anticipated wedding day, disaster strikes when a mysterious, long-forgotten time bender crashes to the ground and shatters into pieces. As Jill's family and friends rush to pick up the scattered shards, they are suddenly sent hurtling through time. Now, to ensure her wedding goes off without a hitch, Jill herself must travel to remote periods in time where anything is possible - and work her cake making magic in order to get herself back before the ceremony begins. I played this game a few years ago, and I really enjoyed it then. I was very happy to see it again! It is challenging at times but worth playing. Fast paced, more levels and surprises than Cake Mania 1 and 2. Make and sell cakes for everyone from dinosaurs to pharaohs and beyond. Very good game! This was a fun game. Challenging but not overwhelming. Loved the theme and graphics. This is a great Time Management game. Nice pace and fun characters. This is the best Cake Mania game.